Sarayaku is an Indian village situated in the Amazonic region of Ecuador. 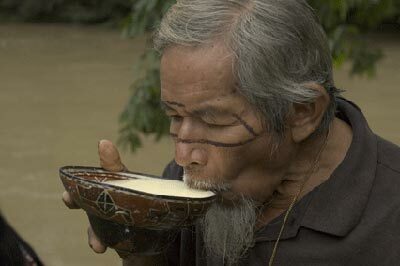 It host some 1,200 inhabitants who have preserved a traditional way of life based on hunting, fishing, and farming. 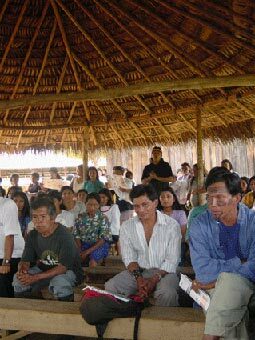 The Kichwa nation of Sarayaku lives on the banks of the Bobonaza River in the Pastaza province. 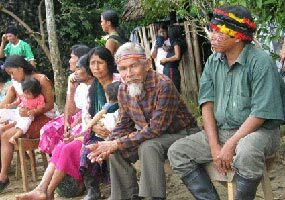 Their ancestral territory covers about 135,.000 hectares for which they were given collective property deeds by the Ecuado government. Up to now it entirely depends on the resources offered by the tropical forest. It still relies on plants for food, medicine, ornaments and rituals, and wood for houses, canoes, household equipment and tools. Sarayaku has its own traditional government based on extremely evolved democratic principles. 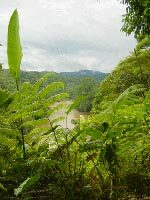 With the forst located in Peru, the Ecuadorian forest is probably the richest in the world in terms of vegetal biodiversity with its 10,000 odd plant species. It also harbours a great diversity on terms of fauna. 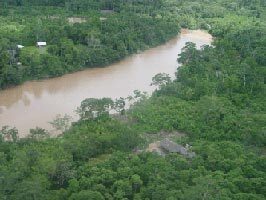 Since the 1960s South American governments relying on the support of the World Bank and other international bodies have grand ‘development’ projects for Amazonia: road building, cattle breeding, monocultures, logging, oil pumping, etc. In this case ‘development’ is synonymous with destruction of the environment and culural genocide. Many Indian peoples have already vanished. And we know that this amounts to as many libraries destroyed. 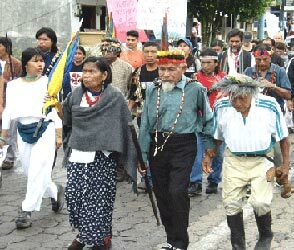 In 1992 indigenous nations of Amazonia left the forest in an impressive march on Quito. After walking some 500 km they reached the capital of the state, high up in the Cordillera. They stayed there for weeks, sitting on the city’s main squares, until they were allowed into the Palace of the Government to negotiate dramatic changes in the Ecuadorian Constitution. Ecuador became a pluricultural state that acknowledges specific rights to its indigenous peoples. 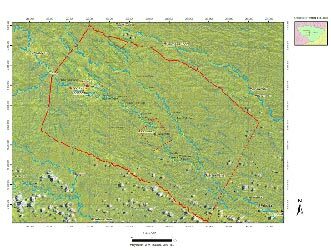 The Sarayaku inhabitants were granted official property deeds on their territory, which was an undisputable historical improvement. The subsoil can still be exploited for reasons of national interest, but they have to be consulted and reach a collective agreement. Yachaks is the name the Kichwa people of Sarayaku give to their ‘shamans’. The function of Yachak is difficult to describe and understand for Westerners. A Yachak is first and foremost a moral authority, a ‘wise man’ who has gone through a long and trying initiation. He is a strong structuring component in the community, both a spritual guide, a social reference, and a healer. As he transmits his knowledge to younger generations he contributes to perpetuating and maintaining his people’s cultural identity. Several disbelieving travellers, among whom many anthropologists, were amazed or even astounded by what the Yachaks can achieved. Unfortunately some sort of fashion has developed which has led to the proliferation of false ‘shamans’ both in South America and in the Western world and a consequent skepticism towards the genuine knowledge of the people of the forest. Elders now endeavour to connect and fight such shams. They must also counter young people’s turning away from tradition and trials which they deem to difficult.